Reborn #6 Review – AiPT! Bonnie may have discovered her husband met someone else in heaven, but dammit she is destined to stop the ultimate evil and she won’t let a prophecy call her a liar! Mark Millar and Greg Capullo’s first arc of Reborn comes to an end. Is it good? MINI SERIES FINALE- The big finale of the smash-hit MILLAR-CAPULLO series REBORN is here. The action-packed climax sees Bonnie taking revenge on past enemies and finding her husband Harry, with Big Tom and Roy-Boy by her side. Capullo has been able to run roughshod over this series with imagination and sheer talent running wild. Don’t even read the words, just flip, and you’ll be taken to another place. It’s that good. Add in Millar’s compelling version of the afterlife and it’s hard to deny this is one of the most unique series in quite a while. Well this dude deserves to die. They said they wanted a climax and boy did they get it. Millar certainly knows how to plot a comic as there are twists, turns, and some unexpected endings in this issue. And yes, endings! It may be a bit pricier, but it’s packed with more pages and thus more art for the reader, but also a satisfying conclusion. One might argue this was all leading to a fist fight, but when it comes to heaven and hell it’s all the more complicated. 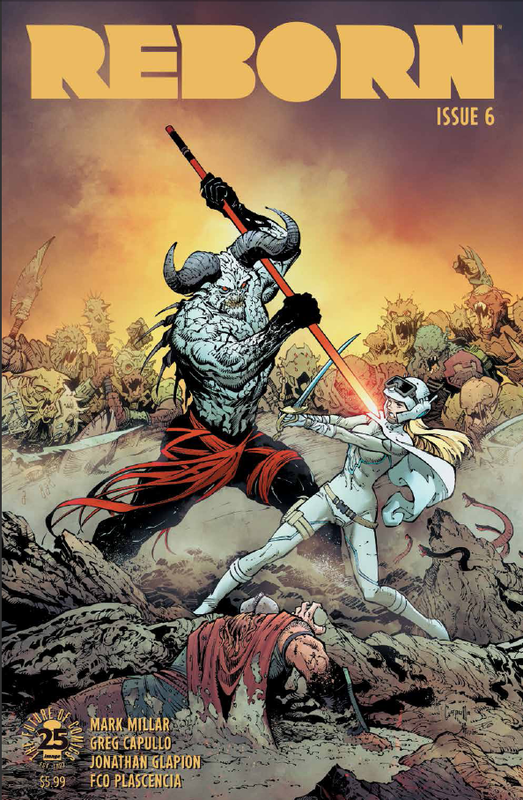 Heaven and hell have nothing to do with it, really–Millar has created something new, but it is complicated in its own way. It’s safe to say Millar has created a Tolkien-like world to explore, but with the heady idea that maybe we all get to adventure in it some day. It’s a great idea that culminates into a big and bombastic ending. The ending just might give you shivers. It harkens to other fantasy works like Narnia or Lord of the Rings, which is quite illustrious company if I do say so myself. By the end of this issue and arc it’s safe to say Millar has created a world you’ll want to explore more of. But hell, without Capullo he would have never gotten there. This issue, like the previous, feels a lot like Capullo carried it over the finish line. That’s because the smallest of panels contain so much creative work. The man is a maniac, pure and simple, because there are so many images that’ll burn into your mind by story’s end. I’ve always thought fairies were kind of silly, but Capullo makes them badass as hell here. A pool of blood becomes this symbolic messenger that’s hard to pull away from. Truly, this work is proof that if an artist puts their all into something it’s iconic. Oh great, now he’s worse. Opening with a reveal of our villain’s real life, I couldn’t help but think we’ve seen this before. At the very least Millar laid it on thickly in earlier issues, which makes the reveal not so revealing. There’s also a twist of sorts that complicates Bonnie’s ability to win the day that feels forced. Maybe it’s because it wasn’t referenced or hinted at at all, but it screams forced. It works when you think about it, but comes out of nowhere which hinders its effectiveness. There’s also a bit of a deus ex machina–another thing to come out of nowhere–that allows Bonnie to even get in front of the villain. Considering these characters are practically gods it makes sense, but it still feels like a cheat of sorts. Reborn shows that we don’t have enough afterlife stories. Why must we be forced to enjoy just the few our religions offer us? No, Millar and Capullo have revealed there are so many more awaiting us, and Reborn is an example that death can only be an excellent beginning. A strong finale with fantastic art and excellent plotting.